The bamboo keyboard shelf not only elegantly keeps your keyboard hidden under its natural body, but also delivers a practical desk organizer to keep your desktop clean and neat. This is a natural and functional keyboard shelf that measures 52 x 15 x 6cm. As we can see from the images, the keyboard shelf features an elegant and minimal design, and the size works well with any standard-sized or compact computer keyboard, moreover, the shelf is made from natural bamboo for a strong construction and eco-friendly feeling. Using four short feet, the bamboo shelf gives you a narrow area to hide your keyboard. Most importantly, the keyboard shelf also features an integrated desk organizer on the top. 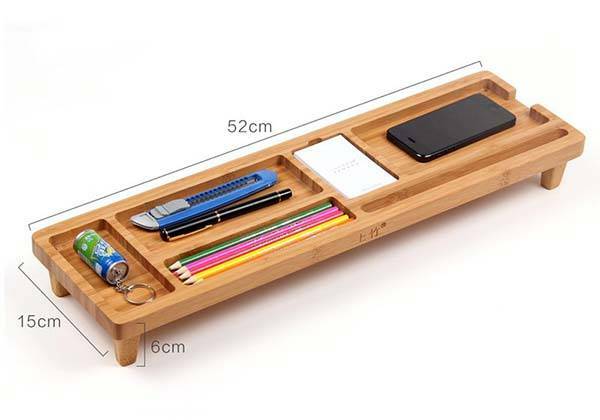 Using 5 individual trays, it helps you organize your items on the desk like pens, pencils, notes, keys and more, and one of trays features a cutout that allows you to charge your smartphone or connect a USB device with ease. In addition, a custom groove serves as a phone stand to keep your phone upright for viewing. 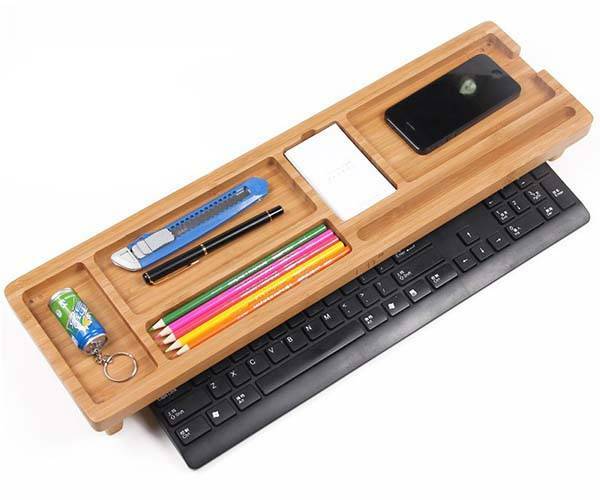 The bamboo keyboard shelf with desk organizer is priced at $28 USD. If you’re interested, jump to Fancy for its more details. BTW, also don’t miss the Prostation 3.0 monitor stand and more related cool stuff by following tags.